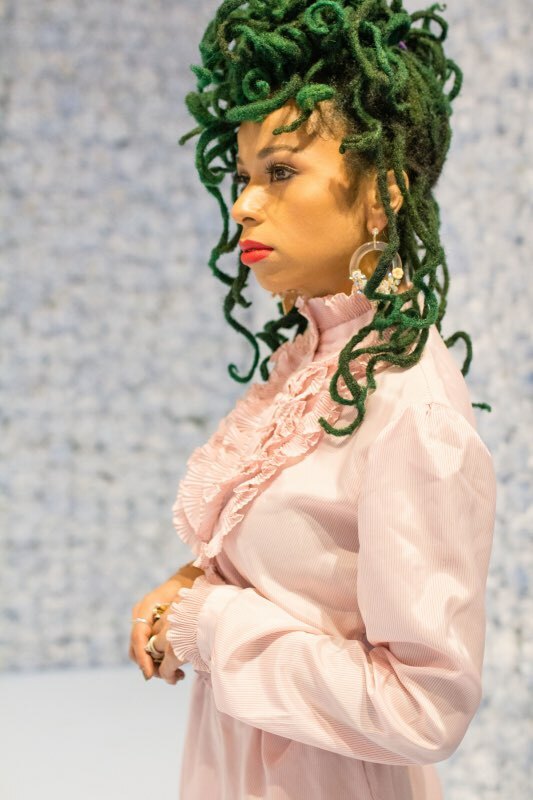 In a space between Heavenly and Otherworldly you can find Celeste, Founder of Eclectic Vibez (salon), nurturing her “tribe.” Lifting the culture with her BLACK, ARTSY, & UNAPOLOGETIC approach. When it comes to natural hair, she is no novice. Long before earning her title as “The Fro Whisperer,” she was utilizing her talents amongst her peers and quite literally went from braiding hair in grade school to transforming strands the world over. She is equipped with 10+ years of experience in styling & maintaining hair of all textures, and has taken the natural hair community by storm with her gift. In the infancy of her professional career, she made the bold decision to no longer offer chemical services to clients and solely commit her time & Energy to her sisters and brothers with natural Crowns. By doing so, she would fill an immense void in the hair world as well as create a place of refuge and healing for so many. As time passes, she becomes wiser and is geared with more experience. Her efforts have become more meaningful and intentional as she continuously strives to spark new perspectives, attitudes & ideas about Afro-hair via educational opportunities that she facilitates throughout the year. Self-love and acceptance are at the core of her teachings as are knowledge and understanding. She has humbly accepted her lofty task of healing a generation and does so, fearlessly, one Crown at a time. In a space between Heavenly and Otherworldly you can find the artists of Eclectic Vibez (salon), nurturing & lifting the culture. A hidden gem nestled away near Houston’s medical center, Eclectic Vibez is a creative space that just happens to be a salon. A sanctuary for self-love. We specialize in naturally textured and transitioning hair. Creating art with every kink, loc, & curl. We are a team of highly trained and skilled professionals that have gained the trust of our clients and community.